IN NEED OF MOVING SUPPLIES? WE GOT THEM! Having the appropriate moving supplies is essential to organizing a smooth move. 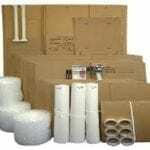 At Van Express Moving & Storage, we offer a variety of moving boxes, packing paper, bubble paper, tape and all the odds and ends, you need to get your possessions packed up for your move. 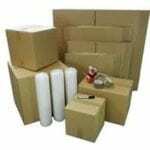 We have you covered, whether you do it yourself or let our highly trained packers do it for you. Take a look at our list of moving supplies below and call us at 973-500-6003 with any questions you might have. Our courteous and knowledgeable team members are ready to assist. 16 quality moving boxes and packing supplies. Will generally hold the contents of a studio apartment or college dorm room. 24 quality moving boxes and packing supplies. Will generally hold the contents of a 1 bedroom apartment. 30 quality moving boxes and packing supplies. Will generally hold the contents of a 1 bedroom apartment. 39 quality moving boxes and packing supplies. Will generally hold the packaged contents of a 2-3 bedroom apartment/home. 41 quality moving boxes and packing supplies. Will generally hold the packaged contents of a 2-3 bedroom apartment/home. 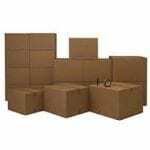 60 quality moving boxes and packing supplies. Will generally holds the packaged contents of a 3 bedroom home. 65 quality moving boxes and packing supplies. Will generally hold the contents of a small 3-bedroom home. 94 quality moving boxes and packing supplies. Will generally hold the contents of a larger 3 bedroom home. 120 quality moving boxes and packing supplies. Will generally hold the contents of a 3 to 4 bedroom home. 130 quality moving boxes and packing supplies. Will generally hold the packaged contents of a 3 to 4 bedroom home. Farouk and Redha are amazing. They do great job at our moving. We had shelves and dining table and they handled with care. We are very thankful. This was the easiest move you can have. Quick quotes that were aggressive and most important, they were accurate. Moved local and they were done ahead of schedule. Polite, attentive work crew that did not waste time. Professional service that I highly recommend. They do great work. Arrived on time service was awesome. Lucas took care of everything anyone moving I recommend their services.